The Chesapeake basin-wide index of biotic integrity for stream macroinvertebrates, or “Chessie BIBI,” is a multi-metric index of stream health applicable to freshwater streams and small rivers across the Chesapeake Bay watershed. It is composed of family-level macroinvertebrate metrics (indicators) that are especially responsive to differences between high quality and degraded stream conditions. The index is calculated from stream macroinvertebrate samples collected and counted by state, federal, and local agencies and other groups. Data are integrated into a common database by the Chesapeake Bay Program (CBP) and the Interstate Commission on the Potomac River Basin (ICPRB). The BIBI index was developed in 2011 and updated and refined in 2016-2017 with support from the CBP. A final report was reviewed by a technical advisory group and is available below. Click here to view an annotated presentation on the Chessie BIBI. The final report, appendices, and a basin map and the Chessie BIBI database and data documentation are available below. Turning the BIBI index into an effective management tool requires decisions on when and how to use it. Scientists and managers addressed these issues at an April 2018 workshop. They agreed to measure stream health basin-wide with the Chessie BIBI and selected the 6-year period between 2006 and 2011 as the most practical “2008 baseline.” They identified other needs such as building consensus on what qualifies as 10% improvement, developing indicators of stream function to complement the Chessie BIBI, and using the CBP data protocols and Chesapeake Environmental Data Repository to merge stream datasets in the future. Click here to view the Stream Health Baseline Workshop Summary. Roughly a third of the small watersheds in the Chesapeake region during the 2006 – 2011 baseline period have no macroinvertebrate data, so stream health in these places is estimated with a model that predicts the Chessie BIBI from various landscape and stream features. 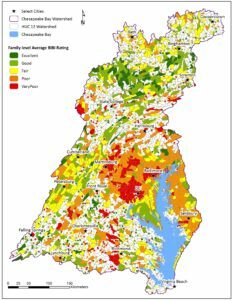 Data analysis of the combined monitoring and model data indicates about 60% of the Chesapeake basin area supported streams in Excellent, Good, or Fair condition during the baseline period. Click here for the 2008 Stream Health Baseline Report. 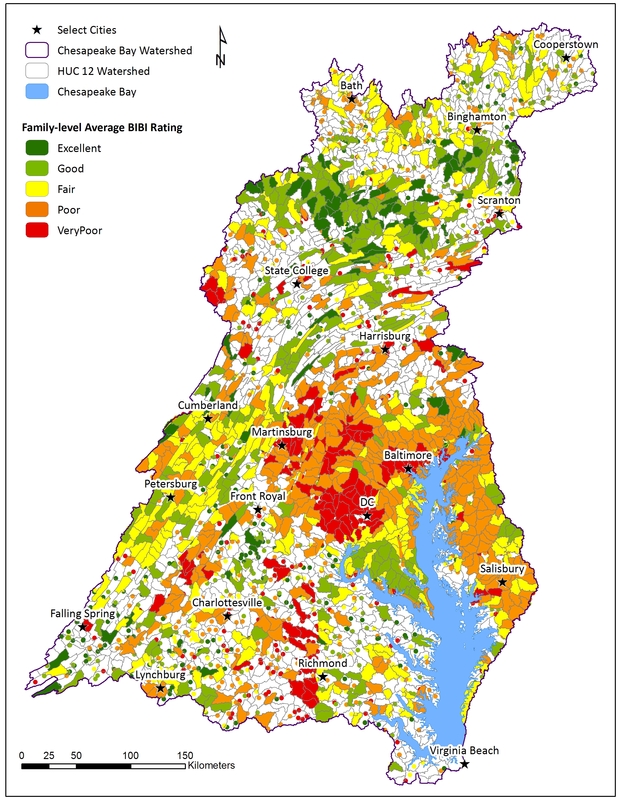 Chessie BIBI (family-level version of the bioregion index) ratings for streams and small rivers in the Chesapeake Bay watershed. When sufficient data (n > 3 catchments) are available, HUC12 watersheds are colored per the rating of their average index score. Otherwise, individual sampling locations are indicated and colored per their ratings. Full citation: Smith, Z., C. Buchanan, and A. Nagel. 2017. Refinement of the Basin-Wide Index of Biotic Integrity for Non-Tidal Streams and Wadeable Rivers in the Chesapeake Bay Watershed. ICPRB Report 17-02. Interstate Commission on the Potomac River Basin. Available online at www.potomacriver.org.